Motorola Moto G series has been a very popular mid-range series which has produced some of the best mid-range smartphones from Motorola users have loved so much till date. 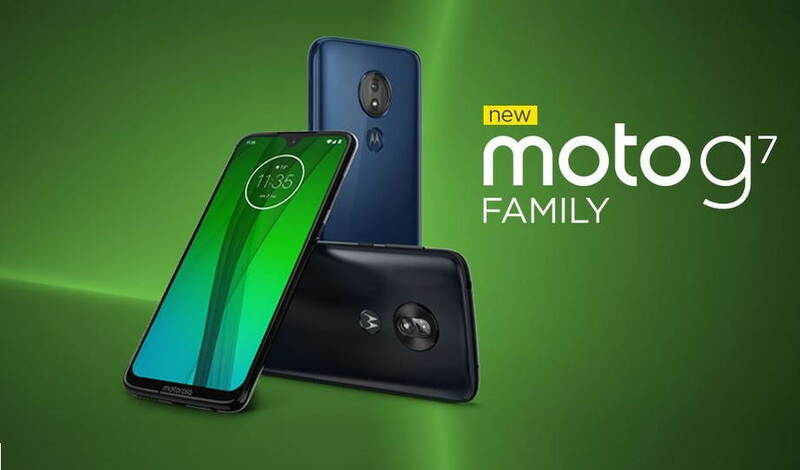 Now, Motorola has launched a new range of smartphones under its latest Moto G7 series. The new range of Moto devices includes a $300 priced Moto G7, the bigger and best camera performer Moto G7 Plus, Moto G7 Power with massive 5,000mAh battery and the most affordable Moto G7 Play. Now let’s have a quick look at the features, price, and availability of the news Moto to devices. The Moto G7 Plus features a 6.2” IPS display with a teardrop notch. The device is powered by the same Snapdragon 632 SoC coupled with 3GB of RAM and 64GB storage. The storage can be expanded later via micro SD card up to 512GB. Except the Moto G7 Power which has a 5,000 mAh battery, all other Moto G7 phones pack a 3,000 mAh battery. The Moto G7 has 16MP main camera with bright f/1.7 aperture and optical image stabilization for photos. The phone also features a secondary 5MP depth sensor. On the front, there is a 12MP shorter. The Moto G7 Power comes with a 6.2” IPS display with 720 x 1,520px resolution and a bigger notch. The phone is powered by the same Snapdragon 632 chipset with 4GB of RAM and 64GB storage. There’s a single 12MP rear camera with f/2.0 aperture and an 8MP selfie camera on the front. The main camera can record 1080p video at 30 fps. Lastly, we have the entry-level Moto G7 Play. The device features a smaller 5.72” IPS HD+ display and a wider Notch. The phone has the same Snapdragon 632 chipset coupled with only 2GB of RAM and 32GB storage which can be expanded further up to 512GB more via micro SD card. The 3,000mAh battery with no turbo power charge. Additionally, all the four models come with dedicated fingerprint sensor at the back, Android 9 Pie and turbo power support, except the Moto G7, Play which only has 5W charging. The Moto G7, Moto G7 Plus, Moto G7 Power and Moto G7 Play is available in Brazil and we have no further information about its global availability.